Who scored Grant's picks this week? There sure were a lot of stories to choose from in Daytona. 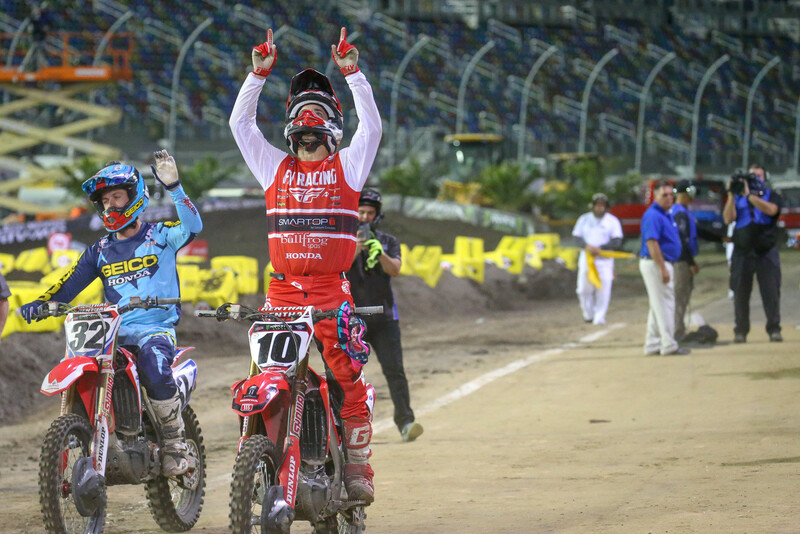 Following a Main Event win at the Triple Crown event last week, I felt that Justin Brayton was ready to battle for the win of a normal length Main Event. And I guess he did, too, as he went out and led nearly the entire race on Saturday night on his way to the first Main Event win of his career. I'm pretty sure everyone, and I mean everyone, in the industry is happy for Justin right now. He's one of the nicest guys around, and he's been grinding away in this sport for a long time, so to see him finally achieve one of his career goals at one of the toughest rounds of the year was something else. Hell, I still can't believe he won. 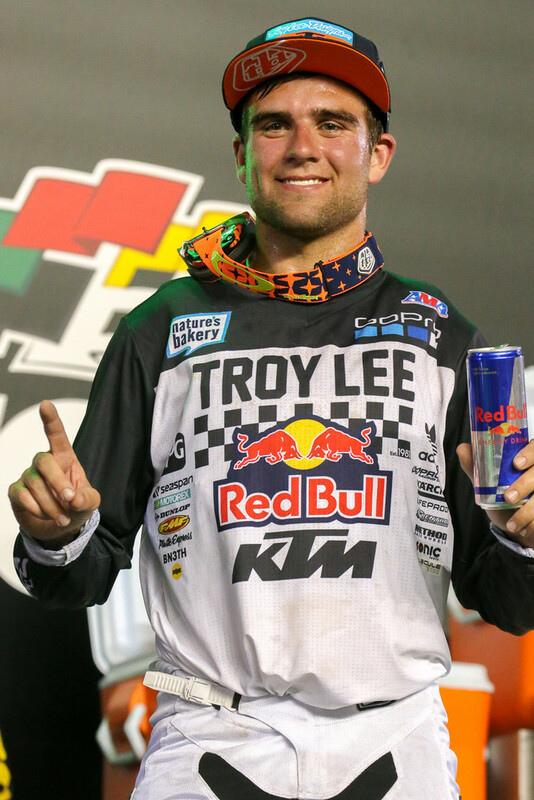 This is also huge for his team, Smartop MotoConcepts Racing, which had never won a Supercross Main Event until Daytona. Just good news all around, really. Considering all of the stories this sport had coming into the season, I never thought I'd be saying this, but I really think that Justin Brayton is the surprise of the season. As I pointed out last week, he still hasn't finished outside of the top ten, and now he has won a Triple Crown Main Event, and a regular length Main Event. I'm looking forward to seeing what else he can accomplish this year. Justin Brayton may have stolen the headline for the night, but holy cow, that was one heck of a ride by Eli Tomac. He was dead last, folks. Dead. Last. And he came back to almost win the thing! He was blowing the doors off of dudes as he was coming through the pack. It was very reminiscent of his ride in Salt Lake City last year, but, you know, this time he charged from 22nd. I've touched on this earlier in the season, but it really is a shame that the potential title fight between Tomac, Musquin, and Anderson never came to fruition. If all three of them were close in points right now, these races would be even more exciting. 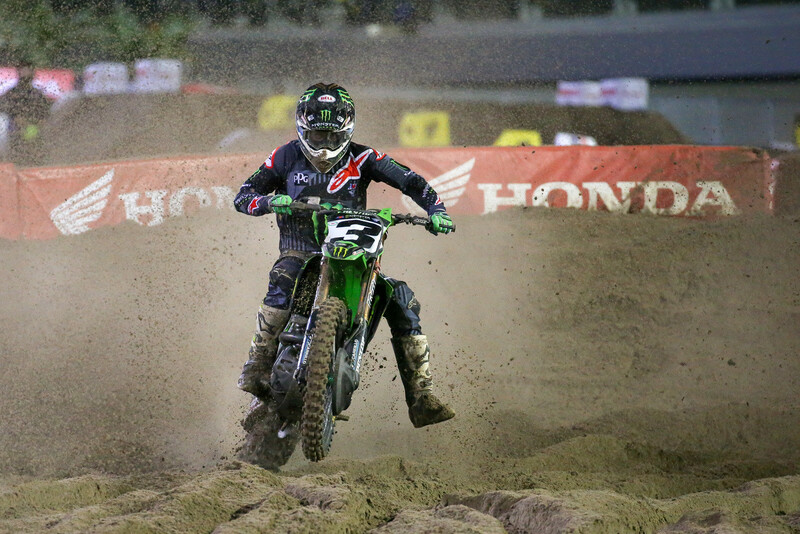 It was a weird night for Jason Anderson in Daytona. He went down in his heat race and had to fight the entire race to slip into a qualifying position on the last lap, which set him up with a bad gate pick for the Main Event, and then he went down early in the Main Event and once again had to spend the entire race charging. And, man, he looked sketchy while doing it. There were a couple of times when you could see him going through the whoop section in the background, and he was getting bucked all over the place and looking like he could go down at any moment. He survived, though, and was able to snag a seventh and only lose two points to Marvin Musquin. He still has a comfy lead of 39 points heading into the next round, but he's going to want to keep rounds like this one to a minimum. Speaking of weird, it was extremely weird to see Marvin Musquin essentially have a meltdown during the Main Event. He made the one mistake that resulted in him flying off of the track, and then he went down again and continued to go backwards. He eventually pulled it back together and charged up to fifth, which is where he finished, but at one point it was looking like he was going to get to the front and check out. So to leave that many points on the table had to be disappointing for the Frenchman. If he wants to claw his way back and attempt to challenge Anderson for the title, he can't have any more rounds like Daytona. After challenging for the championship last year (and even holding the East red plate at the final round of the season), it's safe to say that there were some hefty expectations on Jordon Smith's shoulders this year. And through the first three rounds, I don't think that he was quite living up to them. He struggled with bad starts at the first two rounds, and then he wasn't able to capitalize on decent starts in Atlanta. 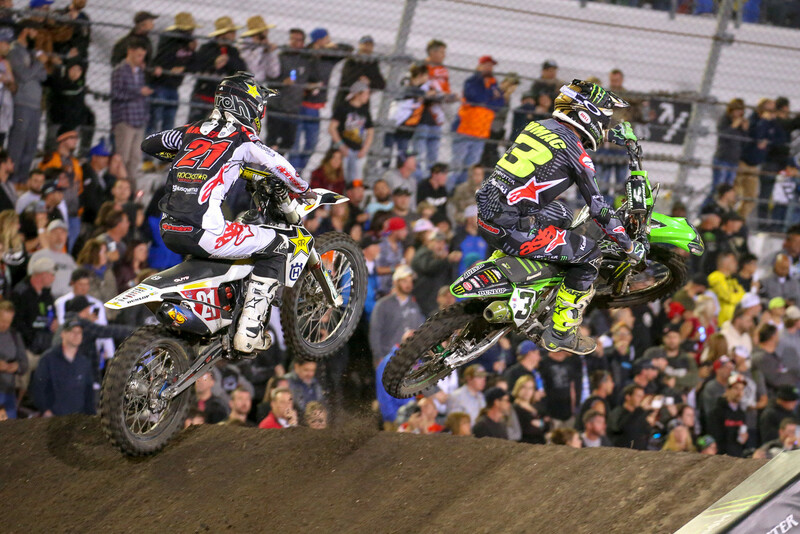 He turned it all around in Daytona, though, when he got the holeshot and led every lap of the race. He also looked silky smooth the entire time, despite the track being fairly torn up. So while Austin Forkner and Zach Osborne may be tied for the red plate, Jordon Smith may be the one to keep an eye on over the next couple of rounds, as he's now only eight points out of the lead. Since winning the opening round of the season, Zach Osborne has watched his lead shrink each week and now he has to share the red plate with Austin Forkner this coming weekend in St. Louis. It hasn't been from a lack of speed or skill, as he has been the fastest guy on track multiple times over the past couple of rounds, but he has been struggling with bad starts and little first turn crashes that have held him back bigtime. He may be one of the best pack slicers we've seen in a long time, but even he can't slice through the entire pack and get to the lead in a 15-minute Main Event...there's just not enough time. St. Louis is going to be a very important round for Zach. He needs to stop the bleeding and re-establish himself as the sole red plate holder, otherwise his confidence may suffer a bit. Another week, another rider goes down injured. This time it was RJ Hampshire, and jeez, has the injury bug favored him over the past couple of years, or what? It seems like every time he gets back on track and starts to live up to his potential he goes down with some sort of injury. It doesn't sound like he'll be back any time during this Supercross season, either, which is no bueno. Heal up, RJ. We also have to note Jimmy DeCotis in here, too. He also suffered a back injury and will be out for a while. Let's be careful out there, gang. 2nd pic down. I kinda teared up on Brayton's win and Laughed my tail off at Craig doing the....Ole Great One, as he rode alongside of JB. Two Class Acts. Hell yeah man, I've already re-watched Brayton's heat race, and the main event like 3 times since Saturday night hahaha!